If you drive a classic car now, there's two things that make you very different from the people your car was originally made for: you're a hell of a lot less likely to smoke, and a hell of a lot more likely to have a computer with you at all times. My daily driver was made in 1973, and the car was very clearly designed with these constraints in mind. Specifically, that means it has an ashtray on the dash and no provision to hold an IBM System 360 Mainframe or similarly gargantuan computers. Of course, the world is very different now. I hardly know anyone who still smokes and pretty much everyone I know has a little computer in the form of an iPhone or Android phone that's always with them. That means I should really think about some of the vestigial parts of my dashboard. Like the ashtray. Let's change the ashtray's function from supporting the disgusting habit of the 1970s (smoking) to the disgusting habit of the 2010s (constant smartphone use). Here's how to do it. Oh, and since this will get pointed out, I may as well say this. After I came up with the ashtray-to-iPhone dock idea, I was feeling so smug I was having some shirts ordered that said "ME ARE A GENIUS." Then I decided to Google the smartphone dock/old ashtray idea. I'm not the first. I'm not even close. I cancelled the shirt order, but this just proves it's a solid idea. So, onward. The basic idea is really simple: let's put an iPhone (or Android) dock inside the little drawer-like ashtray. Let's get it hooked up to the car's 12V for recharging, and patch it into the stereo. For many old cars, this solves the very big question of Where The Hell Did People in the 60s and 70s Put Their Nonexistent Cellphones? Cars now are full of little nooks and power jacks and phone connections. Old cars, not so much. My old Bug didn't really even have a good dash-nook to put a phone, or even a cigarette lighter for power. I installed the 12V socket years ago, and this ashtray conversion will take care of the rest. It's a pretty easy hack, too. This is the sort of thing you can do really cheaply (possibly even free) and in an hour or two at the most. • First step: Find the ashtray and take it out. Clean it out. Because, let's face it, it's disgusting. Mine had Parliament and Kool butts from the mid-to-late Carter administration. And so much grey dust. Get in there and scrub. • Get rid of all the springy smoker's equipment: Most old ashtrays had little spring-loaded shields to protect the dash from cigarette burns and one of those little doohickeys to hold the cigarette. Take out everything you can so you have a basically empty little drawer. • Mark where your wires should exit: This is the tricky part. Many old ashtrays fit into a little metal cubby that's separated from the rest of the dash, to keep gross ash out of the rest of the car. I wanted to avoid drilling holes in the actual car itself, so I wanted to see where the ashtray drawer had any exposed area to make my wire access hole. I put the ashtray in all the way and looked at the bottom, and found a small area that was exposed outside of the enclosed ash chamber. Mark it with a pen, then drill holes for your wires. • Get your phone dock: Here's the thing— no matter what iPhone you have, almost any of the small desktop docks will work. Until that new mythical iPhone comes out, it's all the same connector. The shape of the phone itself has changed, so I suggest removing the plastic upper cover. Doing so exposes much more room for your phone to fit— even with a case. I have an iPhone 4 with a cheapie rubber case, and it fits just fine in a stripped-down original iPhone dock. Which is what I used. I suspect Android-based phone users will have a similar array of options. • Mount the stripped-down dock in the ashtray: There's lots of ways to do this, and will vary based on the size and shape of your ashtray. I used a combination of high-density foam I had laying around and strong Velcro to mount my dock. The foam helps keep the dock in place at the right height, and the Velcro makes a strong but removable (for whatever new docks I may get someday) mount. Other methods, including JB Weld, epoxies, pourable polymers, or almost anything else that can hold the dock in place work fine. Make sure you have comfortable cable access. • Plug it all in, shove the ashtray back in the dash, and try it! Thread your cables through the access holes and plug the USB and (if needed) separate audio cables into the dock. Carefully replace the ashtray assembly into the dash, watching the cable routes carefully. 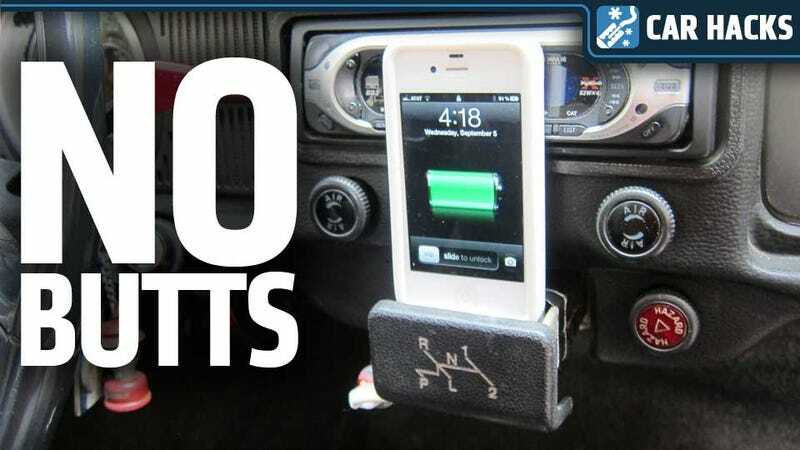 Connect the USB side to either your head unit or adapter for power, and your separate audio cable if needed, and pop your phone on your new dock. Look at you, bridging decades of technology! On my old Beetle, the iPhone placement turns out to be kind of ideal. The phone is securely mounted, it gets power, it can play through my radio, and I can finally have a useable Navigation system in my car, with a screen I can see at a glance. Plus, I can remove the phone, push the drawer shut, and boom, it's 1973 again. I'm excited to have a use for the ashtray, anyway, since mine is a relatively rare autostick shift-pattern ashtray, from when my car started life as a semi-auto weirdo. It's manual now, but I like the strange little reminder. If anyone's done this, I'd love to see your results in the comments! You know how nosy I am.